The present article was originally written for EURASIA FOCUS, a monthly newsletter edited by the consulting firm AESMA™. In the 18th and 19th century, Russian concern for Christians in the Middle East used to shape Russian policy towards the Ottomans. France had an analogous way to deal with the area: religion mixed with geopolitical ambitions. During the Cold War, the Soviet Union had kept friendly relations with some Arab countries, such as Egypt and Syria, and incidentally problematic relations with Israel, yet the balance of power evolved in the 1970s. In 1972 in Egypt, Sadat expelled Soviet military advisors in reaction to Moscow’s reluctance to provide his regime with enough weapons. After the 1973 War, Egypt’s foreign policy changed in noticeable ways, including a peaceful coexistence with Israel and a new alliance with the US. In the late 1970s, Syria and the USSR needed each other since the former was isolated and the latter was losing influence in the Middle East. Between 1979 and 1981, the situation justified the Syrian foreign policy for the following decades: the Egyptian-Israeli peace treaty, tensions with Iraq and Turkey, as well as the Israeli annexation of the Golan Heights. Surrounded by hostile neighbours, Syria could rely on two major allies: Iran and the Soviet Union. After the invasion of Afghanistan at the end of 1979, Saudi Arabia and some other monarchies felt threatened and, much to Moscow’s dismay, they deepened their ties with the United States. The growing American influence in the area -especially in Israel, Egypt and the Gulf monarchies- and the extreme unpopularity of Moscow’s invasion of Afghanistan throughout the Muslim world made Syria appear as a loyal partner. In October 1980, Assad signed a Treaty of Friendship and Cooperation in Moscow, as a symbol of amity and, above all, common interests. Based on mutual understanding, cooperation between the two countries has not always been running smoothly. After Israel’s invasion of Lebanon in 1982, the Soviets were blamed for their inaction, even though Andropov, who succeeded Brezhnev, supplied the Syrian regime with all the required planes and weapons to rebalance the situation. Soviet-Egyptian relations resumed in 1984 and Moscow moved closer to “moderate” regimes such as Kuwait. In 1990, Syria also adopted a new strategy taking the form of an alliance of convenience with the “West” against Saddam’s Iraq in exchange for the occupation of Lebanon. Despite disputes about arms sales (insufficient against Israel), the collapse of the Soviet Union was perceived as a tragedy by Damascus. Under Yeltsin’s presidency, the creation of new states in Central Asia and the Caucasus distanced Moscow from the Middle East both politically and geographically. However, cooperation between the two countries was inevitable for many reasons. First of all, there were concrete links. In fact, the Syrian army was equipped with Russian weapons and thus needed Russian expertise and could hardly find new suppliers, not to mention that Syrian debt was significant. Moreover, Russia wanted to play a part in the Israeli-Palestinian conflict, for instance by calling for reconvening the Madrid conference “in Moscow or any other place” (Yeltsin) in 1996, and then needed Syria’s support in the area. Lastly, Yevgeni Primakov, Foreign Minister from 1996 to 1998 and Prime Minister from 1998 to 1999, advocated for multilateralism and solidarity with Syria. During his first term, Vladimir Putin was extremely cautious and circumspect towards the Middle East, and did not attend Hafez el-Assad’s funeral in June 2000, whilst French President Jacques Chirac and U.S. Secretary of State Madeleine Albright were present. Although they did not expand, Russian-Syrian relations discretely continued. Syria and Russia were on the same wavelength concerning the Iraqi crisis and both countries called for the end of sanctions and opposed the use of force against Baghdad. Unlike some Arab countries, Syria regarded the Chechen conflict as a Russian domestic affair and Damascus even welcomed the pro-Russian Chechen leader Akhmad Kadyrov. In 2005, Russia agreed to write off 73 per cent – 9.8 billion dollars – of Syria’s net debts to Moscow. After the Hariri assassination in 2005 in Beirut, Russia supported its ally. From 2004 to 2007, Russia supplied Damascus with surface-to-air missiles, MIG-31E and MIG-29M aircraft, despite Israeli criticism. Along with arms sales to Damascus, mention is often made of Russia’s Mediterranean naval facility at the Syrian port of Tartus: under a 1971 deal with Syria, Russia has been leasing the Tartus facility as part of the multi-billion-dollar debt write-off. President Assad agreed to convert the port into a permanent Middle Eastern base for Russia’s warships. The Syrian Uprising began in March 2011, and turned into a bloody civil war. Behind the Russian support to Damascus, many issues are at stake. On the one hand, before the Presidential elections in Russia, many opponents, including Gorbachev, thought about a similar uprising in Russia against Putin’s so-called “Chekist” regime. On the other hand, according to Moscow, balance and stability must be preserved, and a slippery slope towards a foreign intervention would lead to a quagmire. NATO expansion, the Yugoslav wars, the 2008 South Ossetia War, the plans to deploy a US missile defence shield in Poland (cancelled in 2009), the situation in Afghanistan and Iraq, and the Libyan operation (“in breach of international law” according to Moscow) may explain Russian mistrust towards the “West”. More than geopolitical interests, Moscow and Damascus share a siege mentality, which is justified in some respects. Russia and China have vetoed three UN Security Council resolutions that threatened Syria with sanctions. 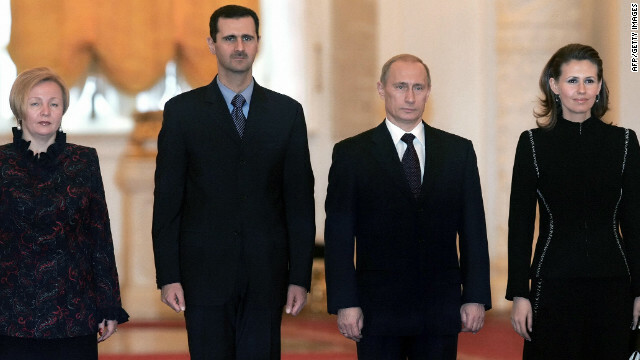 Unlike his Western counterparts, Putin wants to reach a compromise in Syria without Assad’s leaving as a precondition. The high level of uncertainty about the situation in case of a regime change is alarming. In fact, the opposition is particularly heterogeneous, and some zealots may threaten inter-confessional coexistence, a key point for Moscow. Militarily, Russia’s support seems also effective: Turkey reportedly abandoned the idea of bombing Syria’s antiaircraft weapons and missile systems on the borders. In June 2012, Syrian antiaircraft gunners had taken down a Turkish aircraft fighter. Turkey’s request for Patriot missiles at the end of the year is so far the last chapter of escalating tensions. Let us compare Russia’s position with that of all the countries supporting the rebels. Before, one question could be asked: is the confrontation within the UN Security Council accurate? Russia and China are maybe a chance to avoid a hazardous and expensive intervention, and to identify perfect scapegoats. In this way their vetoes could be seen as a blessing. Many countries seem to be promoting a regime change in Syria: old Damascus’ enemies (the United States, France, Saudi Arabia), but also new enemies (Turkey and Qatar). Unlike the latters, Moscow has not questioned the alliance and rather focuses on a necessary national dialogue as the only way to put an end to bloodshed. The rebels and their allies reject any agreement with the current Syrian president, as though he were not supported by anybody. Russia is harshly criticised for its position because many people think its support allows President Assad to continue the so-called “massacre”. However, any unbiased observer can see that it is far from being the intransigent position of this conflict. Putin and the Foreign Minister Lavrov cannot oblige the Syrian president to leave. They are certainly overestimated. The national dialogue is a kind of safe alternative to prevent the State (not the regime) from falling apart. At the same time, the rebels are politically legitimated and encouraged to carry on fighting by hook or by crook. Surprisingly, Russia and its allies appear like the only ones willing to pacify the area. Such a statement would be of course exaggerated. The Syrian people are the only ones who have an urgent need for peace. The rebels’ allies have no intention to stop the war until the regime is broken. Moscow has no intention to let Assad down. There is a level of status quo in each position.